VDUB Diagnostics is located in Winnipeg, Manitoba, Canada and specializes in repairing Volkswagen and other European vehicles.Started by Graeme Clark in 2007, VDUB Diagnostics has quickly grown to be a respected destination for quality and affordable repairs. With over 20 years of experience focused on VW and other European models, Graeme has a breadth of knowledge that is unmatched by others. If you have a Volkswagen or European model vehicle in need of regular maintenance or repair, trust VDUB Diagnostics to get you up and running and help keep you there. V-Dub Diagnostics is a business sponsor of iATN, which means they have access to over 2.0 million years of automotive experience through the iATN Knowledge Base and network of over 80,000 members. They have been a member of the International Automotive Technicians Network since 2009. 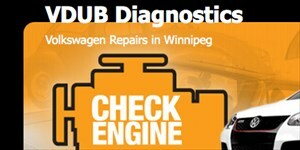 VDUB Diagnostics provides the highest quality service to Volkswagen and other European model vehicles in the Winnipeg area. Email: You can contact V-Dub Diagnostics through this form.